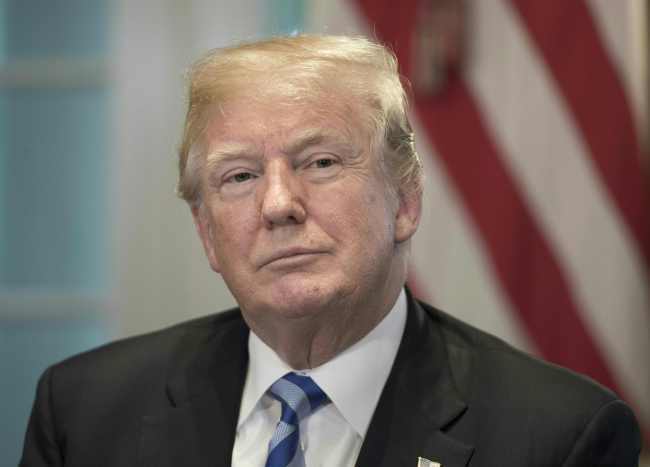 WASHINGTON -- US President Donald Trump said Tuesday that he looks forward to a second meeting with the North Korean leader, after Kim Jong-un said he is ready to meet any time. "'Kim Jong Un says North Korea will not make or test nuclear weapons, or give them to others - & he is ready to meet President Trump anytime,'" Trump tweeted, apparently citing a PBS News Hour report on Kim's New Year's address earlier in the day. "I also look forward to meeting with Chairman Kim who realizes so well that North Korea possesses great economic potential!" Trump did not address the rest of Kim's speech, in which the North Korean leader also warned the US not to test the country's patience with continued sanctions and pressure. A US State Department spokesperson told Yonhap earlier, "We decline the opportunity to comment." It was Washington's first response to Kim's annual New Year's Day speech, which was watched closely for a hint of the future of stalled denuclearization talks between the North and the US. The portion of the speech Trump referenced, quoting PBS, was where Kim claimed to have taken "various practical measures" after "declar(ing) at home and abroad that we would neither make and test nuclear weapons any longer nor use and proliferate them." Should the US respond with "trustworthy measures and corresponding practical actions," Kim said the countries' relations will "develop wonderfully at a fast pace." But a continuation of the current US policy of sanctions and pressure may compel the North to "find a new way" to defend the country's interests and achieve peace and stability on the Korean Peninsula, he said. The US president has touted progress with the North and heaped praise on Kim, saying the two "fell in love." A second summit is being planned for January or February, according to Trump. Kim said in his address that he is "ready to meet the US president again anytime, and will make efforts to obtain without fail results which can be welcomed by the international community." Victor Cha, senior adviser and Korea Chair at the Center for Strategic and International Studies, noted the timing of the speech. "Making this speech that appears open to negotiating after a period of stalled diplomacy at the end of 2018, may be seen as an opportunity to have the leaders meet. At least that is what the negotiators will want to do," he told Yonhap.